If you like this blog and would like to see me host a comedy quiz show on pseudoscience, come to Pub St-Paul on Sunday, November 16 at 5PM for a fun evening of comedy, reason, and alcohol! 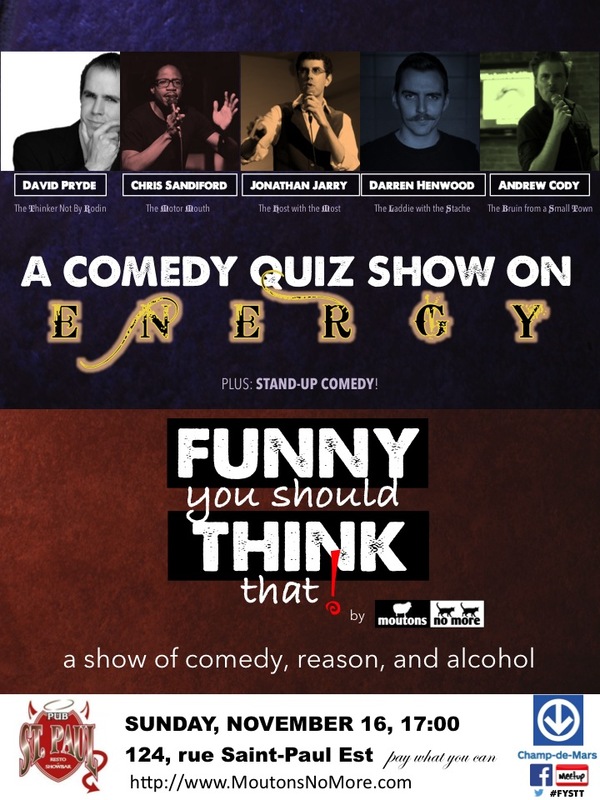 Andrew Cody, from Within Reason, will be a panelist and will be joined by Montreal-based stand-up comedians Darren Henwood, Chris Sandiford, and David Pryde, who will end the show with their own brand of stand-up comedy. You can RSVP via Facebook or on Meetup, or if the whole process is too complicated for you, just show up! Free admission; we ask for donations. Tags: alternative medicine, miracle cures, moutons no more, pseudoscience, treatment. Bookmark the permalink.